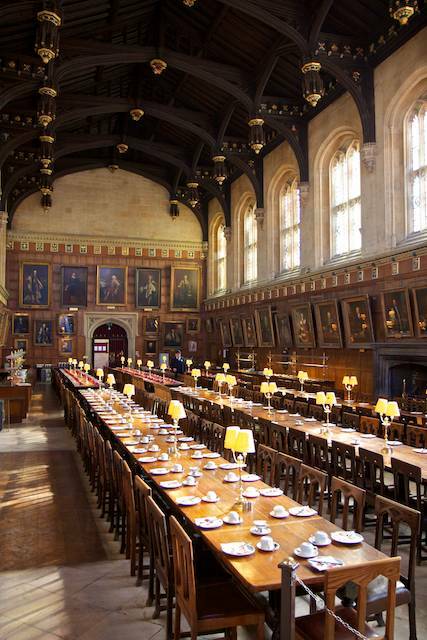 Follow the footsteps of the world’s favourite wizard Harry Potter through Oxford’s most spectacular College. Many of the scenes in the Harry Potter feature films are shot in various locations of the College and as you walk around the cloisters and quadrangles it is easy to see why. This continues Christ Church’s long association with children’s literature – Alice’s Adventures in Wonderland were inspired and written here by Lewis Carroll. If you enjoyed the film or the books, come and soak in the atmosphere of a real Hogwarts. The Great Hall (in the photograph, right) was replicated in the film studios to create Hogwart’s Hall. Only one of our portraits moves, sadly, but many of the faces are the real “Wizards” who have changed the way we understand the world. As Harry and the new first-years enter Hogwarts they are greeted by Professor McGonagall. This scene was shot on the 16th century staircase which leads up to the Great Hall. It was just as well they didn’t film this when the Hall was first built, since the wonderful vaulted roofing was only put up 150 years after the staircase. You would have got very wet going for dinner if it rained! The cloisters in Christ Church were first built 1000 years ago. This ancient vintage made them the ideal setting for various scenes. It is here that Harry is shown the trophy his father won as a seeker in Quidditch. We don’t know if the monks who originally lived around the cloisters had their own special games. If they did, they took the secret with them when they left 500 years ago. But who knows………. The stunning film location is around the corner from EC Oxford. Visiting Christ Church is almost obligatory for students who study in Oxford. Don’t miss the magical atmosphere!